Thank you for continuing this journey of The Gospel Project® for Kids. Nahum was a prophet to Nineveh, the capital of Assyria. He wasn’t the first. Remember Jonah? Jonah reluctantly went to Nineveh, saying, “In 40 days Nineveh will be demolished!” (Jonah 3:4). 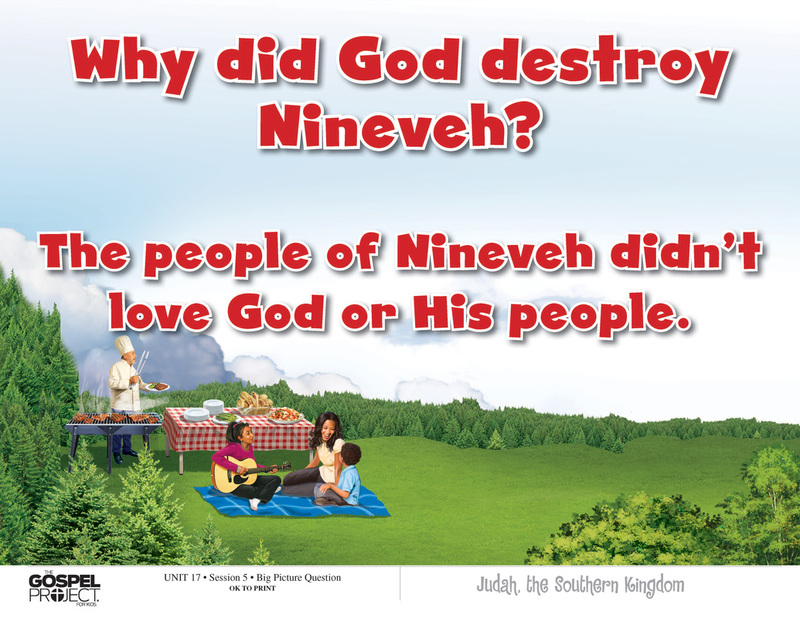 The Ninevites immediately repented, and God spared them. So what was Nahum doing in Nineveh? Well, it wasn’t long after Jonah’s visit that the people went back to their old ways. Assyria had defeated Israel and was a constant threat to Judah. Nahum described Nineveh as “the city of blood, totally deceitful, full of plunder, never without prey” (Nahum 3:1). 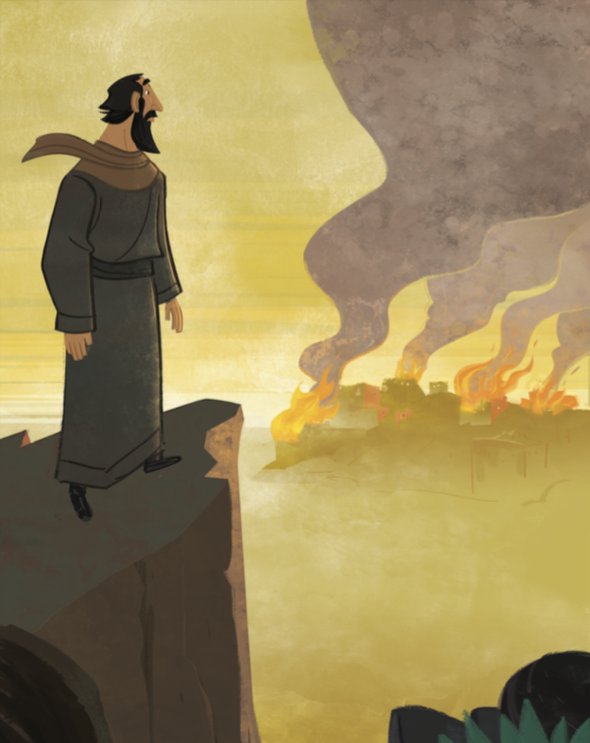 Nahum went to Nineveh to say that God’s judgment was coming. “The Lord will never leave the guilty unpunished” (Nahum 1:3). 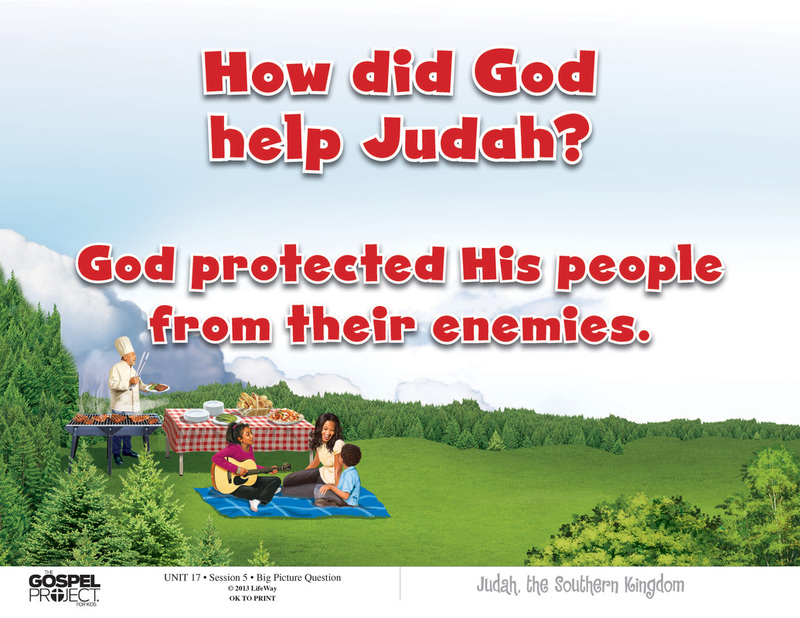 Nahum brought a message of comfort to God’s people, reminding them that God loves His people and will protect them from their enemies. Jesus also brought a message of comfort to His people. Jesus assured us of salvation and peace. All of the enemies of God and His children—sin, Satan, and death—were defeated at the cross. In the end, all evil will be finally punished. God gave a message to Nahum (NAY huhm) the prophet. Nahum took God’s message to Nineveh, the capital city of Assyria. The Assyrians were mean, evil people. They were enemies of God’s people, and God was going to punish them. This is the sad message about the city of Nineveh. This is what God is like: He is a jealous God. That means He wants people to worship only Him. Only God deserves to be worshiped. When people worship created things, they are saying that those things are like God. But nothing is like God! Also, God punishes the guilty—those who do wrong. He is angry with His enemies, and He will punish them. God does not lose His temper; He is patient and powerful. When God comes, He will make the sea and the rivers dry up. The land—all the plants and owers—will die. The mountains will shake, and everyone will be afraid. No one can stand up against the power of God. The Lord is good. When there is trouble, He is a safe place. He takes care of people who trust in Him. But the people of Nineveh did not trust in Him. They were God’s enemies, and He was going to destroy them. set His people free! This message was bad news for Nineveh and good news for the people of God. God told the king of Assyria that he was going to die. He wouldn’t have any children or grandchildren to carry on his family name. This was good news for God’s people. Peace was coming! Now they could worship God and obey Him freely. Their enemies would be gone! The enemy would take the treasures of Nineveh: silver and gold. Nineveh would be empty. The people would be too afraid to ght. but the people would never ght a war again. God had judged other strong cities, like the Egyptian city of Thebes (THEEBS). The people in Thebes were forced from their homes, and their leaders became prisoners. Was Nineveh any better than Thebes? No. Nineveh would be punished too. Christ Connection: Nahum brought a message of comfort to God’s people, reminding them that God loves His people and will protect them from their enemies. Jesus also brought a message of comfort to His people. Jesus assured us of salvation and peace. All of the enemies of God and the enemies of God’s children were defeated at the cross. In the end, all evil will be nally punished.